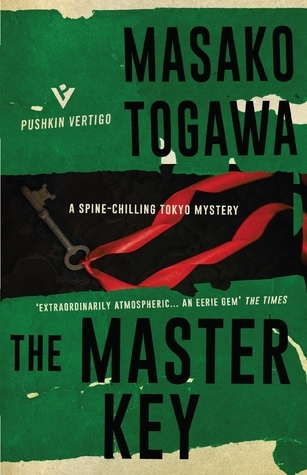 The Master Key from Japanese author Masako Togawa is another entry in the Pushkin Vertigo line. Regular readers of this blog know that I’ve read several books from this series, and that I’m a huge fan of the Frédéric Dard titles. The Master Key is set in the bleak, dark K Apartments for Young Ladies. At one time, the rules and regulations regarding occupants and visitors were strict. Men were not allowed to stay overnight, and of course, all the occupants were female. The over 100 occupants are no longer “young ladies” but longtime tenants who are “old maids.” The apartment building is now rundown, and depressing, and its “one hundred and fifty rooms connected by dark corridors into which the sunshine never penetrates,” are representative of the lives of the residents. “The long years have wreaked havoc on both the building and its inhabitants.” The lives of these women, who were once vibrant and successful, are sad and depressing, and there’s a horrible irony to the name of the building, along with the idea that the residents were once segregated from men in order for their virtue to remain intact. Katsuko Tojo, one of the receptionists who has limited mobility. Professor Toyoko Munekata who is devoting herself to completing her husband’s manuscripts. I liked The Master Key, but unfortunately I guessed the central twist early on, so that took the fizz out of the novel’s Big Reveal. The creepy atmosphere of the building and its mostly forgotten residents is well created and the detailed lives of the residents are incredibly sad. It’s really useful to see where this fits in your order of preference for the Vertigo titles. Probably a bit melancholy for me right now, but it does sound pretty effective. Like you, I think Frederic Dard has been a great discovery for Pushkin. Such a prolific writer too – there must be so much there for the publisher to explore. I’m still tempted by this as I loved all the Japanese crime novels I read last year. It does sound a bit bleak and melancholy. If you’d loved it I’d have gone for it, but as it is I think I’ll skip for now. Yeah, I have a feeling that your reaction would be similar to mine.